I love the Fall. It is a time to embrace and accept change. Autumn is a time of endings in nature and provides a valuable lesson to us as well. Dying to the old to make way for the new. Everything about the fall is perfectly aligned with this purpose, as we should be. Nature doesn't fight change or struggle to hold onto what once was. It's a season of acceptance and letting go. As the leaves on the trees turn vibrant colors, they say good-bye to the mature life they had in the warm, lazy summer, so should we. They are dying to what was for a time, only so they can transform into something new. Permanence doesn't exist in nature. Even the winds change to blow away the vestiges of what once was to prepare us for the introspection needed during the winter. You must shed your summer self and let go of what was so you can begin again anew. Allow the winds to blow away states of mind that no longer serve you. Thoughts are even more temporal than the seasons. They exist only when we empower them. You can change the season of your thoughts whenever you want, while nature follows a prescribed path. Use the fall season to sweep away any thoughts that made you feel fearful, weak, less than others, or lacking in any way. Change the color of your thoughts to more beautiful and vibrant ones. Embrace the wind. It is there to blow away your dead leaves and to eliminate states of mind that don’t serve your highest good. Images and feelings that may have stagnated within you over the summer and emotional doldrums that have set in. Accept the change as the trees do, with grace and equanimity. Windy energy makes me feel anxious. My mind can be a bit scattered. I can feel like there is a bit too much going on. It's my motivation to trim out some of these thoughts and I encourage you to do the same. What would a tree say about losing its leaves? They just fall away and shed them gracefully and magnificently. The process is natural and necessary. What a great lesson from nature! Nature is the easiest teacher. We get the message directly. Getting things intellectually can be a slow process. I often need to study something many times before I know it. Getting something from direct experience is a faster learning experience. The leaf on the tree that represents lack needs to be dropped. In the present moment there is nothing lacking. The truth is that NOW is perfect and complete. Pay attention to the present moment. The only reason we suffer at all is because we project memory into the present moment and the future. This is how the leaves of the past clog up our experience. If we don't tell the mind to shed these leaves of the past, there is less opportunity for growth, or new expanded experience. Come into this moment, because it is PERFECT! Ask yourself, what is the source of this experience? Right away, your mind does not know. Hinduism says it is Shiva. This means the source of that which is not. Carrying the impressions of the past doesn’t allow the moment to create from nothing. When I worry about something, like the well-being of a loved one, I have to stop and work with that false belief. It’s a leaf I want to drop. This season reminds us to let go. But this actually needs to happen all the time. We all have a fear of losing control. These are the brown ugly leaves that can go. Life keeps generating stories. The mind is a story teller and needs guidance to create stories that are freeing and expansive. When we don't let go continuously, these energies can deteriorate in our bodies and create disease or emotional pain. If you come across a difficult situation, the Hawaiian Ho'oponopono forgiveness practice is amazing. When someone or something triggers judgement or pain, just say to yourself "Please forgive me. I love you. Thank you." This is a radically powerful energetic practice. I encourage you to play with it. Be curious and experiment. You need to really feel into these expressions with the understanding that you drew the experience to you. This is why you are apologizing to yourself and asking for forgiveness. In this practice, you are accepting full responsibility for your experience and recognizing that we are all ONE. This takes care of the latency issue of creating this story. This sends the message to your mind to drop these thoughts that don't serve you. Drop them! You have permission to let it all go. The truth is that there is nothing but source. The nothing is always becoming something. Give your mind permission to drop what it has been carrying around for so long and let the wind carry it away. The emotional burdens are given permission to leave. They are dropped in their glorious color and expression. This is freeing. It opens you up to vitality and growth. Lose the emotionally charged memory. Be daring enough to experiment with letting go. Practice shedding anything that creates pain. Trust that growth will come. Whatever it is drop it! Autumn has beautiful energy. The wind comes in and cleans up. Will you use this as an opportunity to drop anything that no longer serves your highest good? Be present and accept that which is and the truth of who you are is revealed. You are beautiful and always changing. Embrace the changes in you. I sure hope so. Because I want you to not just survive, but to thrive! Last week, I found myself getting open, honest and vulnerable with a colleague. She then did the same. It was amazing, really. It was a moment of unexpected intimacy between the two of us. Our interaction was candid and real. We both needed to vent out stress over a situation. I'll spare you the details, but it made me wonder why we don't question our beliefs and perceptions more? When I was a kid, I questioned everything. Why do I have to? Where am I going? How do I know that’s true? Why can’t I do it differently? If I do this, why does that happen? Why, why why…? And what we learned from the answers to these questions formed our map of life. As we grow up, this unique map with which we analyze life forms our “truth”. These “truths” shape everything we think, feel, say, want and do — and how we solve problems — without our being aware of it. If you’re like most women, you likely struggle to release excess weight. And, also like most, you’ve likely tried a number of diets and strategies that haven’t worked. I put this guide together so you can start to learn how and why specific foods, and drinks, can help you lose weight naturally. The information I’m sharing is not about the latest fad diet; it’s about adding in nutrient-dense foods that have been proven to both aid in weight loss and improve overall health at the same time. When green tea is consumed, it increases thermogenesis or the rate at which your body burns calories. This means that you can do the same level of activity but burn more calories throughout the day. In one study, participants were given green tea on a daily basis, but made no changes to the food they ate or exercise they did. At the end of 90 days, participants lost an average of 2.64 pounds, ¾ inch from their waistline and reduced their body mass index—not bad considering that no dietary or exercise changes were part of the study. In another 12-week study, participants were placed on a diet where they were provided three meals per day. All the food was prepared for the participants. Half of the group consumed green tea. Those in the green tea group lost significantly more weight—24 pounds—over the 12-week period. Aside from weight loss, there are many health benefits to drinking green tea, including preventing cancer, reducing inflammation, and overall heart health. Selecting green tea can be confusing because there are several different forms, including matcha, tea bags, and tea leaves. Your best option is to use matcha, which is a more concentrated, powdered form of green tea. You’ll also want to be sure to choose matcha with caffeine, as studies show that green tea containing caffeine is more effective at supporting weight loss. If you’re using matcha green tea powder, simply add 1 teaspoon of the matcha powder to a tea cup. Then pour hot water that is just under a boil into the tea cup. (You never want to use boiling water when making green tea.) Stir and enjoy. If you would like to sweeten it, add 5 drops of stevia or a bit of raw honey. Drink the tea immediately, as it will get bitter if it sits for a while. When you think about weight loss, you might think you should minimize fat consumption. This type of thinking may be sabotaging your weight loss efforts. Instead, think about consuming the right types of fat. One of the fats that has been found to be beneficial for weight loss is coconut oil. Consuming coconut oil is very different than consuming other types of fat, because it reacts differently within your body. Most types of dietary fats contain long-chain fatty acids, but coconut oil contains medium-chain triglycerides (MCTs), which are metabolized in a unique way. When you consume the MCTs in coconut oil, they move from the digestive tract to the liver. Since the MCTs in coconut oil are "thermogenic," meaning that they require a higher amount of energy to digest and metabolize, they help to boost your metabolism and provide you with additional energy throughout the day. Since the body processes MCTs in this way, they increase the energy that is expended (compared with other types of fats). When energy is used at higher levels, fat loss occurs. Researchers at the University of Geneva found that when 1 to 2 tablespoons of coconut oil is consumed each day, energy expenditure increases by about 120 calories each day. Since coconut oil is becoming more popular, you can find it at most grocery stores. Not all coconut oil is created equal, so you’ll want to be selective about the type you purchase. When you are shopping, you will see two main categories of coconut oil: refined and unrefined. The refined coconut oil will not have the coconut taste, but it has been altered from its original form. For the best health benefits, purchase unrefined coconut oil. Since it hasn’t been processed, it contains more antioxidants and polyphenols, which help to combat free-radical activity within the body. Look for labels with words such as "virgin" or "extra-virgin" to make sure that you are buying unrefined coconut oil. You can start using coconut oil where you might usually use canola oil or butter. For example, if you are using a recipe that calls for 3 tablespoons of canola oil, try using 3 tablespoons of coconut oil instead. Flax seeds are high in both soluble and insoluble fiber, which are important elements of a healthy diet. Fiber is beneficial for weight loss in a few ways. First, it helps you feel full for a longer period of time, helping you consume less food. Second, the fiber content in flax seeds helps control your blood sugar levels. Maintaining lower blood sugar levels supports weight loss, because when your blood sugar levels are high, your body is more likely to store fat. Flax seeds also contain omega-3 essential fatty acids which have been shown to boost metabolism and speed up weight loss. And like fiber, the healthy fats found in flax seeds are beneficial because they slow down digestion and help keep you satiated. There are two types of flax seeds: russet brown and golden yellow. Both types of flax are similar in nutritional value and health benefits, so choose either one. When you shop for flax seeds, you will find them in either the whole form or pre-ground. Always purchase whole flax seeds because the ground seeds turn rancid quickly. You can then easily grind them at home using a coffee grinder or high speed blender, such as a BlendTec or a VitaMix. Your digestive system is unable to break down flax seeds in their whole form. In order to gain nutritional benefits from flax seeds, always use ground seeds. I like to grind enough flax seeds for one week and store the ground seeds in an airtight container in the fridge. The unused whole seeds should be stored in the freezer after the bag is opened in order to keep them fresh. How to Include Flax Seeds in Your Diet. Though it sounds too simple to be true, there are several reasons why drinking adequate amounts of water throughout the day can help you release excess weight. · When you are well hydrated, your organs are able to perform more optimally. This allows your metabolism to speed up, which means you’ll burn calories more quickly. Even mild dehydration will slow down your metabolism. · Natural waste is produced in your body each day from basic functions such as breathing and digesting food. Getting rid of these toxins can be helpful for weight loss, because toxins are stored in fat cells. Water is a great way to flush toxins out of your body. · When you are dehydrated, the blood volume in your body is reduced. Decreased blood volume levels results in lower energy levels, which makes it difficult for you to stay active. · By drinking more water, you’ll naturally end up drinking fewer high-calorie, sugary drinks. Did you know that 75% of the American population is chronically dehydrated? And in 37% of Americans, the thirst mechanism is so weak that it is mistaken for hunger. By simply drinking more water, you may notice that you become less hungry. Brenda Davy, Ph.D., completed a research study at Virginia Tech, and found that drinking water before meals can help you to lose weight and keep it off. In her study, the subjects that drank water before meals lost an average of 4 pounds more than the group that did not drink water before meals. To supercharge your weight loss, make sure that your water is cold instead of room temperature. Cold water causes thermogenesis, which increases the expenditure of energy and helps you to burn fat faster. Researchers found that your metabolism is boosted within 10 minutes of drinking cold water, and those benefits can remain for at least 30 or 40 minutes. A simple rule of thumb is to calculate your water intake based on your weight. Simply divide your total weight in half and drink that number in ounces each day. So, if you weigh 150 pounds, then you should be drinking 75 ounces of water per day. This number will likely need to be increased if you are in a hot environment, or if you have higher levels of physical activity. Also, pregnant and breastfeeding women often need to drink more water. You can monitor your water intake based on the color of your urine. If your urine is bright yellow, then it means that you need to drink more water. If it is a pale yellow color, then you are probably getting enough water each day. Keep in mind that there are other factors that can impact your urine color, such as certain supplements, vitamins, and medications. If you are someone who doesn't enjoy drinking water, then you might consider adding other ingredients to give your glass of water a slight flavor. You can flavor your water with natural ingredients, such as lemon, lime, orange, cucumber, mint leaves, strawberry slices, or pineapple chunks. My favorite is brewing passion fruit tea. If you want it a little sweeter, try adding a bit of liquid stevia, which is a tasty, non-calorie herbal sweetener. Stevia is very sweet, so 6-8 drops is usually enough to sweeten one glass of water or tea. Leafy green vegetables are one of the healthiest and most nutrient-dense foods you can eat. Eating foods with high nutrient levels will keep you satiated longer thereby reducing cravings, because your body is getting the nutrition that it needs. Leafy greens are low in calories and they’re a great source of fiber, which digests slowly and therefore keeps your stomach feeling full for a longer period of time. The fiber in leafy green vegetables also helps regulate your blood sugar levels. Keeping your blood sugar in check will make it easier for you to lose fat and prevent weight gain. The best way to choose your leafy greens is by looking at the color of the vegetable: the darker, the better. Darker vegetables have higher levels of antioxidants and more nutrients, so they’ll keep you feeling full for a longer period of time. If you really want to supercharge your weight loss, start adding collard greens, cabbage, kale and bok choy to your diet. These dark, leafy greens are also cruciferous vegetables, so they pack a powerful nutritional boost. They’re heartier and contain more fiber than other greens. One the easiest ways to get greens in your diet on a daily basis is to add them to a fruit smoothie. 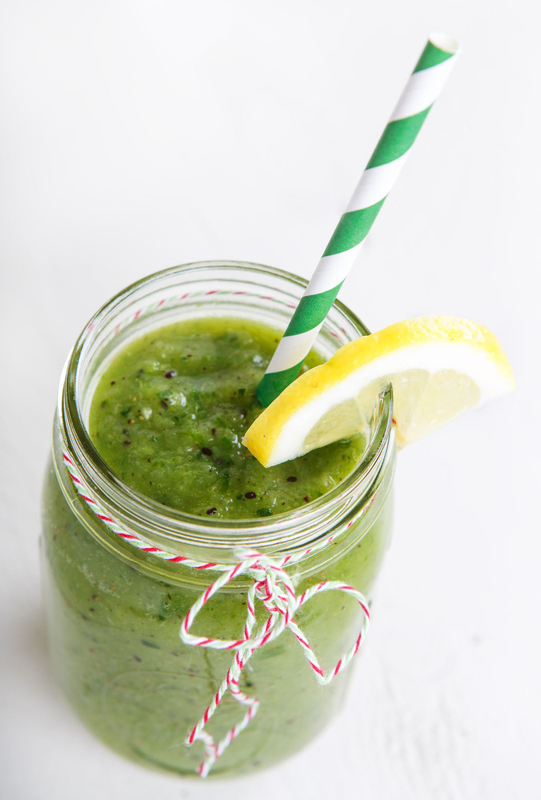 This may sound unappealing, but when you add raw greens into a smoothie, such as spinach or chard, you can’t taste them. Cooking greens is quick and easy. Simply saute some garlic and onion with coconut oil, add your washed greens to the pan and stir fry until they’re tender. Add soy sauce, gluten-free tamari, or simply sprinkle with sea salt. If you find the collard greens or kale to taste bitter, like I do, you can blanch them in boiling water for a couple of minutes before sauteing them. To do this, bring a pot of water to a boil, add your greens to the pot, let them cook for two minutes, drain in a colander, and then sauté in a pan with coconut oil. Now the fun part! As I promised at the beginning, I’m going to share how to easily incorporate all of these foods in your diet – in under five minutes. Make this recipe for a satisfying breakfast or mid-morning snack. In a small bowl, mix the hot water with the matcha green tea powder and pour into a blender. Add the remaining ingredients and blend. Drink and enjoy, knowing you’re treating your body with great care while also having a yummy treat! Don't just survive, but thrive! If you enjoyed this blog, please share it with your friends. Leave your comments below. I would love to know what you think. Learning to live outside the box is essential to living your authentic life. This is difficult because we often have perceptions of reality imposed by society. Our western model of success (a house, kids, picket fence, two cars, etc..), may not bring the fulfillment and happiness you're looking for. Our high-tech, low-touch society doesn't promote your unique brilliance. But there is something greater and unique within you, waiting to get out of the box. Have you ever been told that you weren't good enough? Have you ever felt that your ideas were unimportant? This happens all the time. Belief in judgement and unrealistic expectations limit your potential. Your belief of these lies needs to be transformed into realization of your full potential. Your beautiful, unique expression lives outside the box. Challenge yourself to get out of your box, and crush it. Recycle it into something useful and beautiful. Honestly question your thoughts and beliefs. Ask if they serve you well, or not? Are you just existing comfortably, or are you flourishing? Take time to connect within and stop focusing outside of yourself for gratification This awareness will grow. When we compare ourselves to others, this puts us in a box. When we let other's thoughts and beliefs have power over us, we limit our expression and experience. What if you could consciously be in wonder of everything? What if you could maintain an active curiosity about each moment? What if you could actively play and color outside the lines? Child like energy cannot be contained in a box. So instead of acquiring more things that our culture convinces us will solve our problems, tune in to yourself and start asking questions that will help expose your higher purpose. What would a joyful, authentic life feel like? What if you didn't buy the crap that others fed you? What would if feel like to be your awesome self, no matter what? What would be different right now, if you knew you were beautiful, beyond measure? Because you are. Set your intentions deliberately. Tune in to a higher level of inspiration to discover what you really NEED and not what you WANT. Visualization is a great tool but can be limited if you only visualize what you already know. Visioning is catching an idea outside of your current paradigm. It allows ideas to flow from your internal source. It's a powerful, unique way of asking questions to birth a new experience. Willingness and openness become your guides to leading a fulfilling life. No box will confine your thoughts and inspired action. Nature doesn't judge itself. Learn from nature. Use an acorn as an example. If the acorn were to vision what is intended for it's greatest expression, a vision of an exceptionally beautiful and unique oak tree would emerge. What would need to take place for that to happen? The acorn would need to die to it's original form to grow into something greater. This is evolution. The acorn has something mysterious within that it surrenders to grow. We also contain something mysterious with us waiting to be expressed. It is not the beliefs that society, or others tell us what we should be. We each have a miraculous gift of expression that when allowed to shine, can inspire, surprise and delight. This is how you share your gift with the world. Outside of our present paradigm is something miraculous that wants to emerge. When we get out of the box and be ourselves, life unfolds in wondrous ways. Share your comments below. And if you enjoyed this blog, feel free to share with your friends. Great teachers and sages over millennium remind us to remain mindful of the present moment. There is great power there. Our ultimate gift is to enjoy our humanity. The full range of experience is our pleasure and pain. In acceptance of what is, we find ourselves feeling immense gratitude. It's when we decide or believe something contrary to what is that we suffer. We're all beyond distracted from each moment. How many of you can say that you truly pay attention to the pregnant juiciness of experiencing each moment? We each probably have fleeting moments of appreciation and relaxation into the NOW. But how many moments pass us by, without even noticing? This is when time seems to fly by. And once we have spent our time, we cannot replace it. What a valuable commodity time is! It takes practice, but very little effort. I've been experimenting with this in countless ways for years. Feeling inside my physical body is the barometer for my true connection to the present moment. It has been said that it takes 10,000 hours of practice to become a master. I'm still trying as often as possible. I love to play with it though because it's fun. When any moment opens up to my full experience, it always feels fuller and richer. My perception becomes magnified when I am not distracted by the past or the future. When I allow what is unfolding to be fully experienced in my body, then I feel less resistance. Each moment starts to feel like the play that it is and I feel truly blessed. Play with me, in this moment. We eat every day and how often to you truly relish the sensual experience of food? Get and apple or some piece of delicious Summer fruit. Place the fruit in front of you and examine it in detail. Notice the shape and the smell. It has an essence that you can acknowledge. Love it for being and give thanks for the nourishment it will give you. Now, close your eyes and take a bite of this fruit. Chew it slowly and notice how it feels on your tongue. What sensory tastes are triggered and in what part of your mouth? Enjoy the full experience of eating this fruit. Notice it go down your throat and pay attention to any subtle feelings of it reaching your stomach. Continue to enjoy the fruit in this way. This may have been the best tasking fruit that you have every enjoyed. Why? Because you gave it your full attention and appreciation. Think how this type of daily practice, as you walk through life, could enhance your life experience? Our full attention and wonder of the present moment is our gift. Our human experience is an exquisite adventure and play. So enjoy it and use your time wisely, by paying attention to each precious moment. Be fully grateful and watch your experience become more vibrant and healthy. You were born to thrive, so don't just survive. ENJOY! Why are we so hard on ourselves? Why is it so easy to forgive others yet we have such a hard time forgiving ourselves? The truth is we can be our worst enemy. Self-love is not inspired by vanity, or by acquiring more things. It has nothing to do with thinking you look great or being happy about getting a promotion. Self- love celebrates and supports your entire being through good and bad times. This is much like a dear friend that is always there for you. In fact, you are always with yourself, so why not be your best friend? One of the most important things contributing to you overall happiness is meaningful and loving relationships. And you can’t have solid relationships without love and respect. You have probably heard the saying, “you cannot love others if you cannot love yourself.” Completely loving yourself as you are is necessary in order to give your love to others. Still need convincing? Here are 21 reasons to love yourself unconditionally. Constant learning is your mission. You develop and use your mind to advance your personal growth and experience. You are a true student of life. You nurture your beginner’s mind. You bravely to ask for and give help freely. Your compassion towards people fuels your spirit and touches lives. You forgive, forget and move on. You have learned lessons and use those to enrich your present moment. You are passionate about the things you do. You move throughout your day with purpose and positive energy. You are flexible and open to change. You are confident in your choices and realize change is necessary to live life to its fullest. You are optimistic. You know your approach to problem solving will strengthen your ability to move through life’s challenges. You are playful and spontaneous. You make joy a priority in your life and share that joy with everyone around you. Moments are filled with wonder. You are proud of the work that you do. You bring the best of your mind and spirit to every project. You are forward thinking, but present living. You have a vision for your future so strong you can feel it, but know you will only get there with the actions you take today. You are always looking for the silver lining. You realize that something positive comes out of every negative, you patiently wait for it to be revealed. You are strong and courageous and always stick to what you believe is right. You stand up for your beliefs and lend your voice to those less fortunate. You are ready for challenges. You know that life is not perfect, and there are plenty of tests along the way. You know without a doubt that you can handle it, and that it will serve you in the end. You are respectful and courteous to others and yourself. You recognize the beauty in everyone’s journey and honor those that cross your path. You are accepting of others and their challenges. You realize that judging others only casts a shadow on yourself. You are willing to ask for forgiveness. You realize that you are not perfect and that mistakes happen, and you are willing to accept responsibility for your part. You are open to love. When you love yourself, you open the doors for love to come into your life freely and without limits. You are outrageously creative. Nothing fuels the creative spirit more than loving and accepting yourself. It gives you freedom to nurture a wide variety of talents that might have remained latent. You don’t gossip. You realize the destructive energy behind gossip. Not only do you refuse to engage in it, but you also stand up for those being gossiped about in an effort to change behaviors. You are engaged in your community and in causes that are important to you. You know that it is rewarding to serve others. You attack you problems head on. You avoid blaming others and explaining things away. Instead, you focus on correcting your course. You are motivated and you persevere. You believe that your next success is just around the corner, and that is enough to keep you going. You are a better person when you accept and love yourself unconditionally and understand that you are on a journey to magnificence. This does not mean that you can’t change or improve. It is the realization that you are a beautiful work in progress. Reveal the love that exists within you, no matter what. This miraculous gift of life is far too short to squander. We must enjoy the present moment with vitality and joy. Don’t just survive, be well and thrive.